Varicose veins are enlarged, swollen, and often painful veins close to the skin. They most often occur in the legs and can be a sign of venous insuffiency, or failure of the valves in the veins to work properly. These valves in the veins become incompetent and allow blood to flow backwards. This backward blood flow is what causes these veins to become engorged and enlarged. These symptoms are typically worse at the end of a day and can get better with rest or elevating the legs. If left untreated, these varicose veins will always worsen over time and can lead to significant complications, such as blood clots, skin inflammation and discoloration, and even skin ulceration at the later stages of the disease. 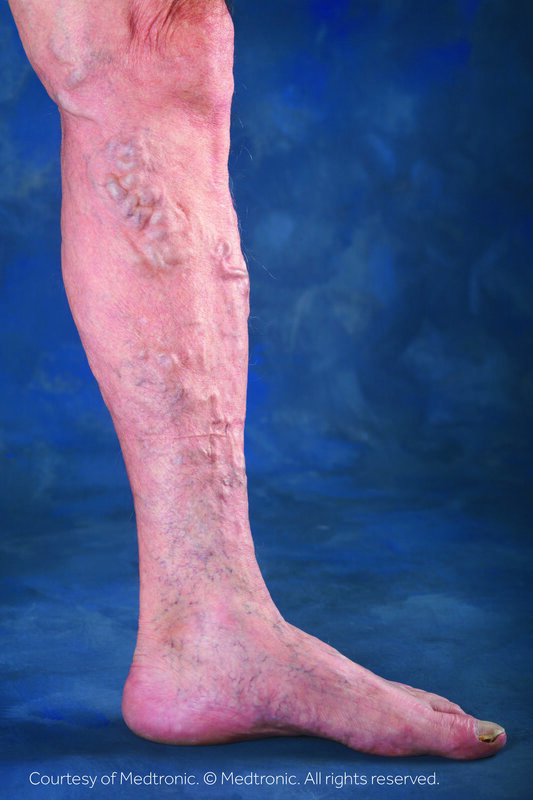 With effective treatment of varicose veins, progression of these complications can be stopped. Vein disease is also known as venous insufficiency or superficial venous reflux. It is a condition that develops when the valves in the veins become damaged or diseased. These damaged valves allow blood to flow backwards in your legs which can cause pooling in the lower part of your leg. This can then cause significant leg swelling. If left untreated, serious complications may develop over time. It is important not to ignore varicose veins and symptoms of venous hypertension. Many factors can cause varicose veins. The most common factor is genetics. A genetic tendency can cause veins to weaken over time. It can even happen in younger patients in their 20’s. Many times other family members have had varicose veins as well. How are varicose veins treated? Is it painful? There are several ways varicose veins can be treated. CVVS prefers the least invasive techniques available that can provide you with the best and most painless results possible. There are two minimally invasive techniques that CVVS uses: The ClosureFast Procedure and the VenaSeal Closure System. Both provide superior and pain-free results that will get you back to your daily life in no time at all. Your Vascular Specialist can provide you with more details for each procedure.